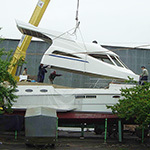 Using modern high-quality composite materials and computer simulation ESTA Ltd reconstructs and repairs boats and yachts. Glass-fibre bulkhead of a yacht of BSY-200S project with a metal hull. Coating of a the deck is a tic. The bulkhead is designed as monolithic glass-fibre construction.